So, a little bad weather can’t keep us down! 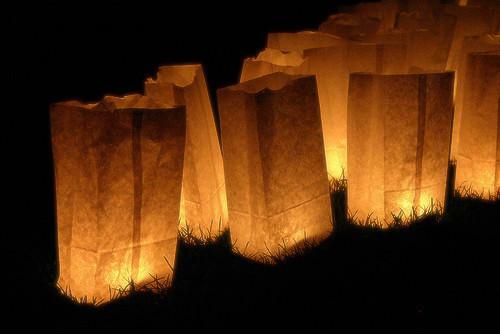 Please join us in lighting luminaries at your homes at 5pm on Sunday, December 16. Then walk, bike, or golf cart on over to Sweet Olive’s porch and side yard for a bit of hot chocolate and cookies. At 5:30pm we will present the check to Yo Art for the proceeds of the Giving Lights fundraiser and then spend a wonderful evening strolling the neighborhood enjoying the lights. We thank Sweet Olive’s, Melinda Armstrong Wrenn, for giving us the space to remount our celebration of giving. Thank you! On Saturday, December 1st plan on donning your most festive holiday gear, (you know, those special holiday sweaters) and come celebrate the season of giving. 6:00 pm: Present the proceeds of the Giving Lights to 2018 recipient, Yo Art, followed by . . . Santa Claus! 6:15 pm: The celebration of the Holiday Season will continue with some treats at the Amphitheater and our traditional Carriage Ride tours to view the luminaries. 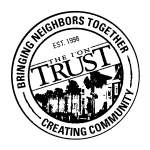 We hope everyone will participate in the luminary project and enjoy the Holiday Festival knowing you are also supporting local non profit that serves are community. ** Sand for the bottom of your bags has been delivered to 3 locations in the neighborhood. 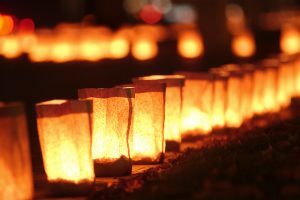 Look for the “Sand for Luminaries” signs, they are bright yellow with black writing. Please know that we have sold over 700 luminary kits, so please take only the sand you will need to put together your kits.